Tonglen for Thanksgiving. Also, a ham and links to many recipes. Early this morning, after starting water for coffee, I put a ham in the oven. For Thanksgiving. Which I’m celebrating this year at home, in Chicago, with a small group of dear, long-time friends. I have so very much to be grateful for. The group of friends who are coming for Thanksgiving, the core of my urban family. My biological family in Florida. Satisfying, interesting work. Exceptional yoga teachers. Robust health. So much that to list it all would take my entire day, which I need to spend in other ways. So maybe for now I’ll just focus my gratitude on this ham. It’s from Slagel Farms. I’m hoping it had a pretty good life. 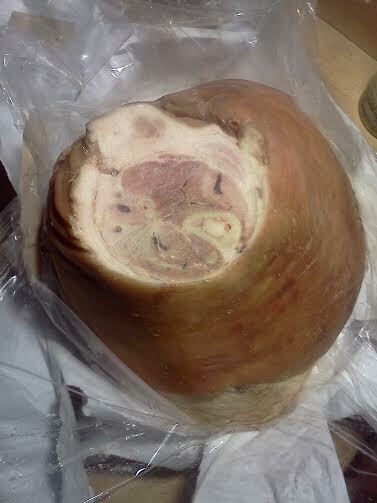 And I’m certain it will be delicious both on its own and then later, when I use the bone for some form of bean soup. This sort’ve ethical (I eat meat with qualms) ham was also affordable, because a friend from yoga invited me to join her and another friend in ordering directly from the farm–we all agreed that 15 dozen eggs divided among the three of us was not crazy. At least not right before Thanksgiving, a holiday that for me is almost entirely centered on cooking a traditional feast that calls for large quantities of eggs. As I’ve said here before, there is little that makes me happier than cooking for people I love. Therefore yesterday, as I made cornbread for dressing, gluten free pie crusts for pecan pie, and cranberry orange relish, and while I rubbed salt and organic coconut sugar and black pepper into the very expensive organic turkey that another friend and I bought through the food co-op that I hope one day will form here in Chicago, I danced in the kitchen. I felt joy. Side by side with the joy and gratitude, however, upwelling into unexpected spaces, I also felt, still feel, grief and anxiety. I feel grief because the man I’m in love with is no longer in my life, because one of my sisters died far too young, and because I’m in the process of releasing so many delusions about who I am, what my life is, how I fit into this world. I feel grief about the state of our world, for all of those who are suffering untold horrors. For the contemptuous ways in which we humans too often treat each other and ourselves. And I feel anxiety over who knows what. The state of the world, yes, but also for some nameless unknown. In my life, anxiety comes in tiny waves that roll relentlessly through my small self, constant stories about this and that, him and her, me, them. It is the background music of my life. Looking back, I think I’ve always been anxious. Indeed, at my sister’s memorial service earlier this month someone who knew Valerie long ago told me that her (this woman’s) babysitting career ended because of me. Apparently I would not stop crying no matter how she tried to comfort me. I was too young to remember that particular episode, but I have countless childhood memories of curling up with various pets, finding solace from the storm of feelings that I did not know how to handle and that no one around me was equipped to understand or resolve. It was the 70s. As a young adult I found relief from anxiety in marijuana, which I smoked for years and years. It worked in a way. I was able to function in social settings, I was able to relax and feel normal. Have fun. But I believe that smothering my anxiety with drugs also choked off my ability to grow into the person I wanted to become. Because contrary to everything I learned as a child and young adult, anxiety is not something that needs to be pushed away. It is an invitation. For the past month or so I’ve been doing an online meditation class through Dharma Ocean. Like Forrest Yoga, the form of meditation taught at Dharma Ocean is an embodiment practice. But meditating is for me much more challenging than yoga. There are no poses. There’s just you, on the cushion. When I practice yoga I know I’m supposed to be feeling my body. And sometimes I do. But usually, despite continual attempts to stay in my body, I live primarily in my head and mostly in the future. Worrying, planning, thinking. I know that the solution is to practice yoga each morning at home, to meditate. And every day I have the best intentions. Then, most days, I make coffee. I write in my journal. Time passes. I have to go. It’s happening again now. If it were a regular Thursday I wouldn’t mind too much because I would go to Gwen’s 4 pm class at Yoga Now. But today is a holiday. There is no class. I’m on my own. I want to meditate, I want to practice yoga, to have ceremony for and with myself on this day, to show up and do the things I know I should be doing to be fully alive and able to be my best self. Instead I’m here, in my head, trying to work this out in writing, to share my experience with all of you. Which is important to me. I’m not sure why. Lately I think maybe writing is yet another way in which I distance myself from my feelings, another distraction, another defense mechanism. But, at least right now, I think that’s okay. 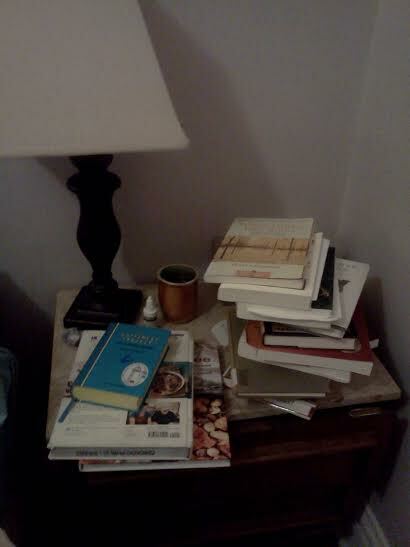 Last night, lying in bed, I picked up one of the books on my crowded nightstand. Pema Chodron’s When Things Fall Apart: Heart Advice for Difficult Times. It is one of the books I have to read and write about in order to reach Level Two certification for yoga teacher training. Like so many of those books, I’ve read it before. And I can’t seem to get it together to do the rather daunting homework. So instead, as with the other books, I pick this one up on occasion, open it at random, and read a few words here and there, usually before bed. In reading this I realized that while I might not have made time to meditate or practice yoga, I could easily practice Tonglen throughout the day whenever I felt grief or anxiety. I started right then, in bed. Breathing in the sharp pain of missing people I love who I will not see again in this lifetime. Allowing the feeling to permeate my body. Softening around the feelings, enfolding them with compassion for myself and all the others in the world feeling those same feelings. Exhaling a hope that we might all be free from suffering. That seems a good wish for today, for always. Today I certainly won’t practice yoga. I doubt I’ll make time for formal meditation. Instead I am going to cook and clean a little in preparation for my guests. Then I’m going to spend time with them. Between now and then, though, I am going to practice Tonglen. I shall be sending out hope that all beings be free from suffering. Including you, whoever and wherever you are. Thank you for reading this. May you be well. May you be at peace. May you be kind to yourself. May you accept yourself as you are. And may you have a Thanksgiving that is happy, whatever happiness means for you. For me, sometimes happiness comes in feeling sadness. It is the happiness that comes from knowing I am alive. I am grateful. I’m writing this from one of the two couches in my mother’s tiny apartment in Tallahassee, a couple of hours before I leave to return to Chicago. I’ve been in Florida for two weeks. This is at least the fourth time I’ve tried to write a blog post. I’m not sure what’s going on. Maybe writer’s block? Must be. Because I have a lot to say. Too much, perhaps. But every time I try to write something happens, I freeze. Stop. Decide to wait until later, when maybe it will come. And now here I am, the last day, still without having posted anything. Oy. That won’t do. So I’m writing this. Which will have to be good enough. Hopefully inspiration for more will return soon. Before vacation, there was a different problem. For a week or so after my last post, I was just busy and overwhelmed with life. Then I had the flu. Which took me out for almost two weeks. It was awful on so many levels, probably mostly because of the surprising emotional component. There’s nothing like being sick with no one around to make you feel alone. It was a good wake-up call. To what I’m not yet sure, but it was a call to something, if only to make sure I always have some chicken soup in the house. To be grateful for my health, I suppose. Which I am. It is nothing to take for granted. Now, as I prepare to head back to Chicago, I am absolutely filed with gratitude for having been born and raised here, in Florida. It’s a strange place, yes. I left because I couldn’t live here, had to escape the racism and small-mindedness. Yet it is also the most beautiful place I know, mysterious and deeply, richly alive. Although I took about a million photos and videos, so many that my phone is completely full, I’m having trouble with the transfer. But I have a few. This vacation started and ended in Tallahassee, sandwiching a week on St. George Island. 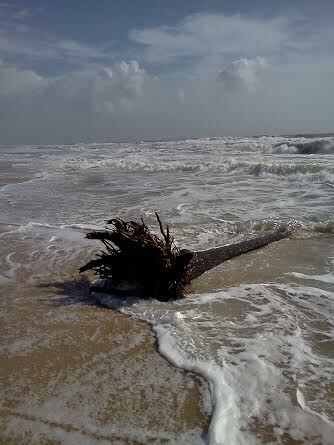 During my daily walks on the beach I fell in love with a tree that had washed up to the shore. Here it is, as it looked during the sunny hours on the one stormy day. 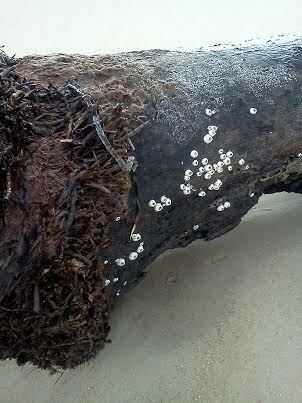 As you can see from the barnacles, it obviously spent some time in the water before washing up to shore. Maybe it came here from Cuba, a refugee. I don’t know. What I do know is how incredibly lucky I am. So, so privileged. It’s so easy to take everything we have for granted. Being alive. Able to get up and go outside, breathe air, drink water, walk. Cook and eat delicious, nourishing food. It’s impossible, I think, to be thankful every moment. Life would become overwhelming. Too serious. Sometimes you, or at least I, have to take things for granted. Yet it seems important to spend at least some time every day in appreciation. Noticing what we have that is good. 1. Preheat oven to 350 degrees. Combine the dry ingredients in a large bowl. Whisk the syrup, honey, and oils, then add to the dry ingredients. Stir to combine. 2. Spread onto a heavy-duty baking sheet lined with parchment paper. Bake at 350 for about 15 minutes, until just starting to brown. Turn off the oven. Stir the granola mixture, return to the oven, and close the oven door. Let the granola sit in the oven for 6 – 12 hours. Transfer to a large bowl, breaking up any large clumps. Store in an airtight container for up to one month. Enjoy!